Fire causes damage in UCross apts. Residents were evacuated from University Crossings at around 7:45 p.m. June 25 due to a flood that originated on the eighth floor and damaged several units. Students of 14 units from floors 2-8 have been temporarily displaced. There were no reported injuries. 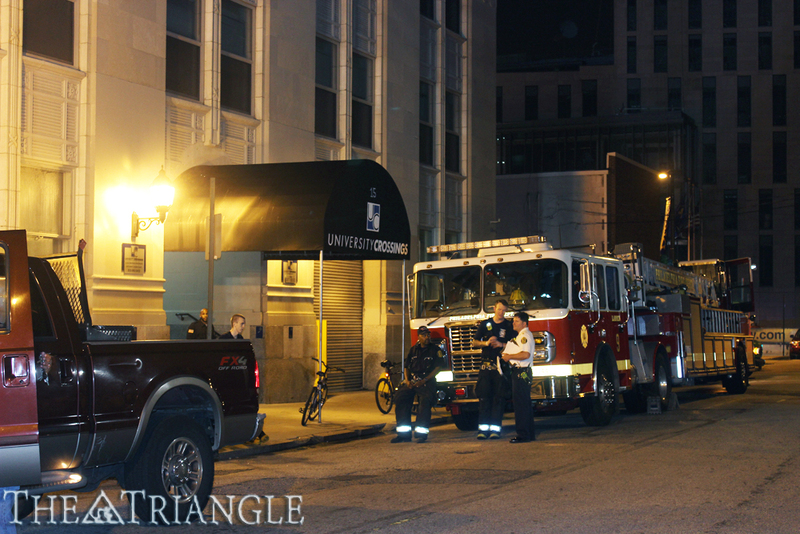 According to University Crossings media relations representatives Gina Cowart and Larry Greenberg, the flood was caused by a lit candle that tipped over and engaged sprinklers on the eighth floor. Greenberg said that any student who lights a candle in his or her apartment is in violation of lease terms. “The fire actually did not do much damage because the sprinkler engaged so quickly, as it was designed to do,” Greenberg wrote in an email. Approximately 40 students were displaced from their apartments and were given the choice of temporarily relocating to Race Street Hall or staying with friends. Brett Rosen, a sophomore software engineering major, was one of 12 students who opted for relocating to Race Hall. Residents of all but the 14 damaged units were permitted back into the building by approximately 2 a.m. June 26, Greenberg wrote. Rosen said that he was not permitted to enter his fifth-floor apartment to retrieve any of his belongings on the night of the flood due to repairs being made at the time. According to an email sent to residents by University Crossings management, residents had until midnight to retrieve their belongings. Unfortunately, Rosen didn’t arrive until after midnight. According to Rosen, he was escorted to his apartment at around 9 a.m. June 26 to retrieve his belongings. The only damages that Rosen observed were minor leaks in the ceiling. “The situation in my room was not as bad as I had thought, and the damage was not difficult to summarize,” Rosen said. Several units from floors 2-8 suffered water damage, which was mostly contained to drywall and carpets. Most furniture was not damaged from the flood, according to Greenberg. Two units on floors 7 and 8 suffered the most water damage. A restoration company arrived on site within two hours of the flood and immediately began to extract water from the apartments and remove damaged drywall. Greenberg confirmed that management is working hard to expedite repairs. Greenberg said that displaced residents will not be permitted to move back into their units until the units are deemed habitable by University Crossings management, the Philadelphia Fire Department, and the Licenses and Inspections Department of Philadelphia. University Crossings management sent a series of emails to displaced residents, updating them on the cause of the flood, accommodations, belongings and insurance. Management urged residents in an email to contact their insurance companies in order to handle claims regarding damaged personal belongings. “We have taken a large number of photos of the affected units so that you can make an insurance claim and have photos available,” management wrote. According to the email, University Crossings cannot handle insurance matters with students’ insurance providers. Displaced students were given access to their units to retrieve belongings during the building’s business hours, according to the email. Management wrote that belongings that were not retrieved by residents would be photographed and placed in storage. “I’ve been able to retrieve enough to get by for a little while, but it’s still frustrating knowing that the majority of your personal belongings are locked away where you can’t get to them,” Justine Higgins, an eighth floor resident and a junior screenwriting and playwriting major, said. An email sent June 25 stated that displaced residents would be housed in Race Hall until June 30 and would be relocated to a local hotel at 3 p.m. if necessary. However, residents were sent an additional email June 27 stating that housing in Race Hall has been extended to July 5 at 10 a.m. The email also stated that students would be notified if relocation to another residence hall between June 27 and July 5 is necessary. “Most residents will be able to move back into their units within two to four days. Residents in two [of the 14] units will most likely not be able to access their unit for one to two weeks, depending on how fast the [units are] dried,” Greenberg wrote. Residents were informed via email that an estimated time of repair completions was not yet determined. “The whole situation is just very stressful because I’m living in temporary housing with no idea when I’m going to get my stuff back or be able to move back into my apartment,” Higgins said. While a final number has not been determined, repair costs will likely exceed $25,000, Greenberg wrote.